Listed below are some of my favorites - as a writer - a reader - or for their teaching ideas and approaches. This is just ONE of many themed poetry anthologies Lee Bennett Hopkins has compiled. Check out this comprehensive list or visiting Lee Bennett Hopkins' website. For Elementary to Middle School | TEKS and CSS Editions. Learn more at the Pomelo Books Website. A favorite for her sensible approach and innovative ideas on guiding children through the writing process. A marvelous companion to Heard's first book, For the Good Of the Earth and Sun. NOTE: Georgia Heard teaches an online course using this book - check out www.heinemannu.com for a current schedule. Ralph takes you "inside" the writing process while keeping it light and interesting. Inspiring! Esbensen's book is one of those "gems" that is out of print. Now, for the good news: her husband designed a marvelous site to keep the memory and spirit of this talented poet alive. You can buy her book from his site and he sponsors an annual award (with a $1,000 prize!) for the most creative use of A Celebration of Bees: http://www.ttinet.com/bje/contest.html. You'll also want to visit the Barbara Juster Esbensen Memorial . 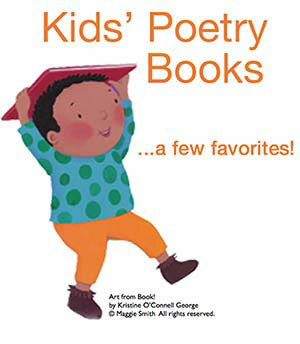 A fabulous resource for children's literature; their poetry section could easily stand alone. Includes a wealth of ideas with suggested poems, a thoughtful discussion of the differences between verse and poetry, and great ideas for integrating poetry across the curriculum. An in-depth look at authoring cycles, literature circles, and an invaluable section on deriving meaning from poetry called "Poetry in Motion." In addition to easy-to-master forms, Janeczko also suggests ways to integrate the lessons into the curriculum. Talented newcomer, Avis Harley, has written an amazing book that includes poems written in a variety of different forms - from A to Z! My copy of Georgia Heard's book bristles with post-its� � testimony to her terrific ideas. Heard tells it like it is - how children need help in "re-visioning" their work - avoiding rhyme - and time to develop their own voices. I love this book! by Stephen Dunning and William Stafford. This classic is also available from NCTE. A terrific introduction and overview of poetry with countless ideas for incorporating poetry into the curriculum. Marvelous! A sparkling collection of songs, chants, and stories that teach children to love books. There is also a 45-minute CD or tape on how to perform the selections yourself. Janeczko gives the young writer exactly what is needed: a straightforward and clearly written book about poetry. Even "older" writers will find much of value here. This unusual anthology was a result of an assignment to our master class in children's poetry at UCLA. We wrote poems using specific pre-assigned words and the results were fascinating: No two poems were alike. I use this book in classrooms to show the diversity of different "voices" and how words and word associations can inspire poetry. This in-depth look at writing instruction in her classrooms is fascinating and inspiring. A must read! A look at the poets who have won the prestigious NCTE award for their body of work. Introductions to poets everyone should know! Inspiration for adult and teen writers alike. Check out the "Poetry Starters" on Kathi's web site (www.kathiappelt.com). Confirms my own discoveries in poetry workshops: Students can write amazing poetry if they aren't "locked into" writing rhyming poems. Routman's techniques include free verse and sample poems written by children. A comprehensive book with a marvelous section on poetry. Excellent ideas on using "classic poetry" as models for student writing. Students create "moon journals" integrating direct observation, art, and poetry in this guided program. I've seen students' work using their ideas and it is glorious! Updated version. Lee Bennett Hopkins includes a key poem by each poet and a brief biographical sketch followed by a list of references. Many wonderful classroom ideas for "motivating and appreciating poetry." A compilation of poems and essays by a variety of poets give a fascinating look into the lives of writers. A reminder of the power of language and the impact of individual words. Ideas that will intrigue and inspire you. Young writers are giving this book rave reviews! I'm constantly misplacing my copy of Mary Oliver's book because I'm always dipping into it and laying it down somewhere unexpected. An exquisite book and a must for anyone who is serious about poetry. This wonderful book is listed for "ages 9 and up." I hope "up" includes adults because I certainly use Myra's book for my own writing! Her sections on the "voices" of poetry as a fresh approach are particularly strong. Creative ways to integrate poetry into curriculum. Comprehensive lists of books and individual poems for use with a variety of themes, including science, math, and literature. Witty and intriguing connections using the alphabet to introduce poems as well as topics. Such as: M for Memory Poems and poems on manners, meals and music. Or: H for How-To Poem or Haiku and poems on horses. Wonderful essays from many different poets. An intriguing look at a dynamic classroom bubbling with poetry. Fascinating and inspiring! Delicious! A must-read for all writers. by Jane Kurtz and Toni Buzzeo have compiled a wonderful guide to "real space and cyberspace" school visits. Excerpt. This combination of memoir and writing guide is inspiring and thought provoking. A delicious read! A wonderful look at children and poetry. Kids and teachers alike will have fun with Paul Janeczko's step-by-step guide to writing funny poems. Some of the forms he discusses: "brat poems," chants, limericks, parodies, riddles, senryu, and "I Spy" poems. For your convenience, these titles are linked to www.amazon.com or Alibris so you can obtain complete information on price and read the reviews for individual titles. However, PLEASE consider using Indiebound should you decide to order a book. Our independent bookstores need our support! Sadly, some of my favorite titles are out of print. However, I've had good luck finding several out-of-print books on my "wish list" at Alibris. I've found the booksellers (often small used bookstores across the country) to be helpful and responsive. f you do purchase a book by following a link from this page, any referral fees are used to fund projects at Donors Choose.